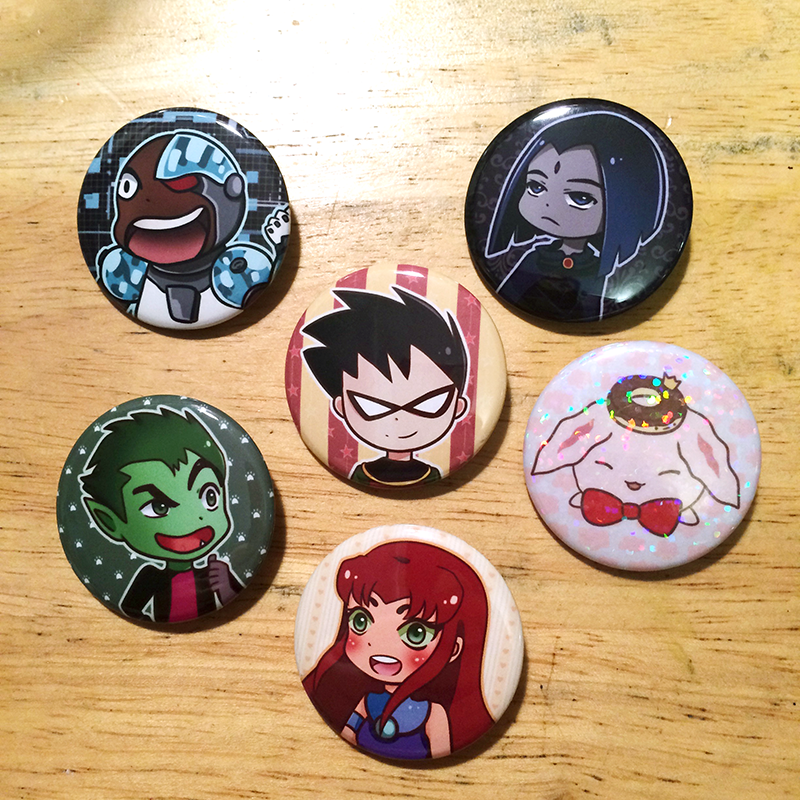 I offer high quality custom buttons with competitive pricing! My buttons are all printed on photo paper using an Epson Artisan 1430 printer, and then pressed with a professional Tecre brand Button Maker. This produces buttons with crisp images and bold vibrant color. 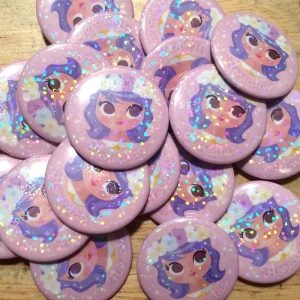 My buttons also come with the option of adding perimeter text around the edges of your buttons. Perimeter text is great for branding purposes! 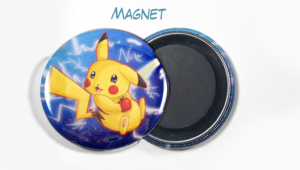 You can add text to the top and bottom rims of your buttons. Some potential uses for perimeter text include; your email address, a link to your favorite social media, your online shop, or a link to your website. 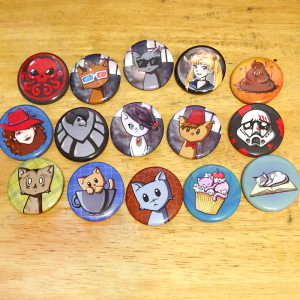 I currently offer two sizes of buttons, 1.5” and 3.5”, and have a variety of different finishes available. 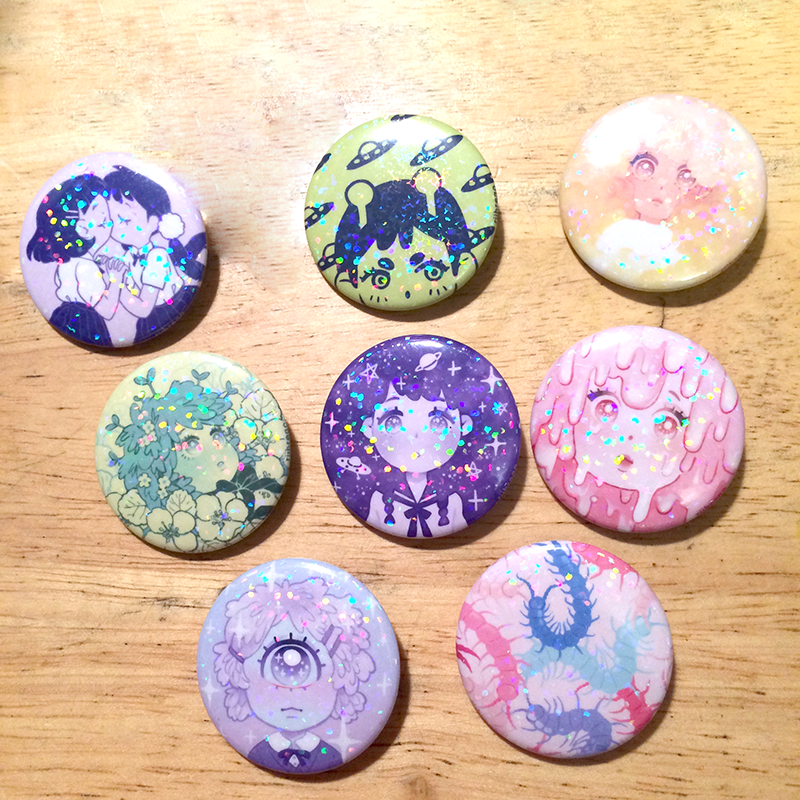 I now offer holographic buttons! 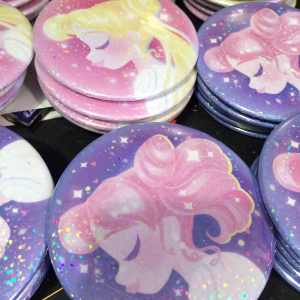 These beautiful holographic buttons are great attention grabbers and help your art truly shine. 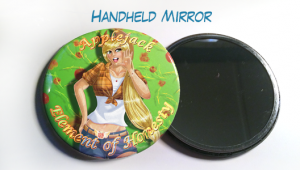 Upgrade any 1.5″ pin or magnet for an extra .15¢ per button, or upgrade any 3.5″ pin or mirror for an extra .25¢ per button. 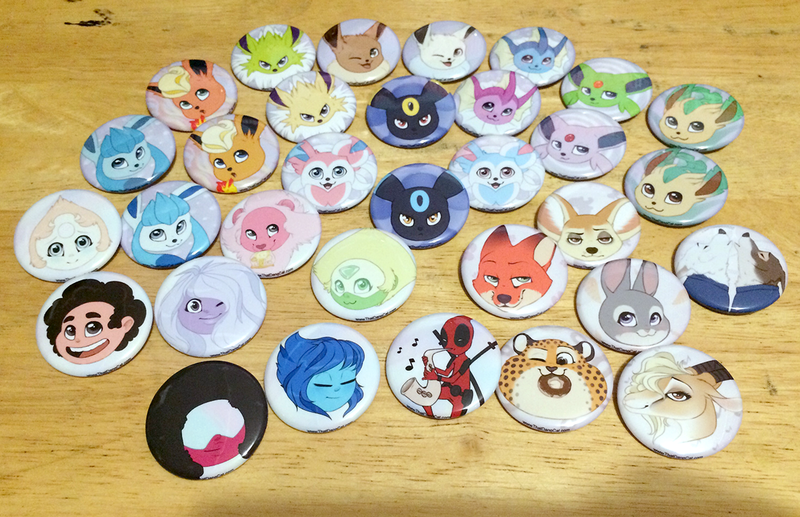 You can order as many, or as few buttons as you’d like! My tiers are just examples. If you want 35 buttons, or 99, I can make them, no problem. 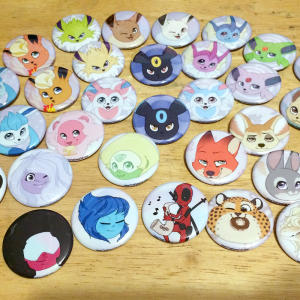 The final amount of buttons you order just determines which tier you fall under in regards to price per button. 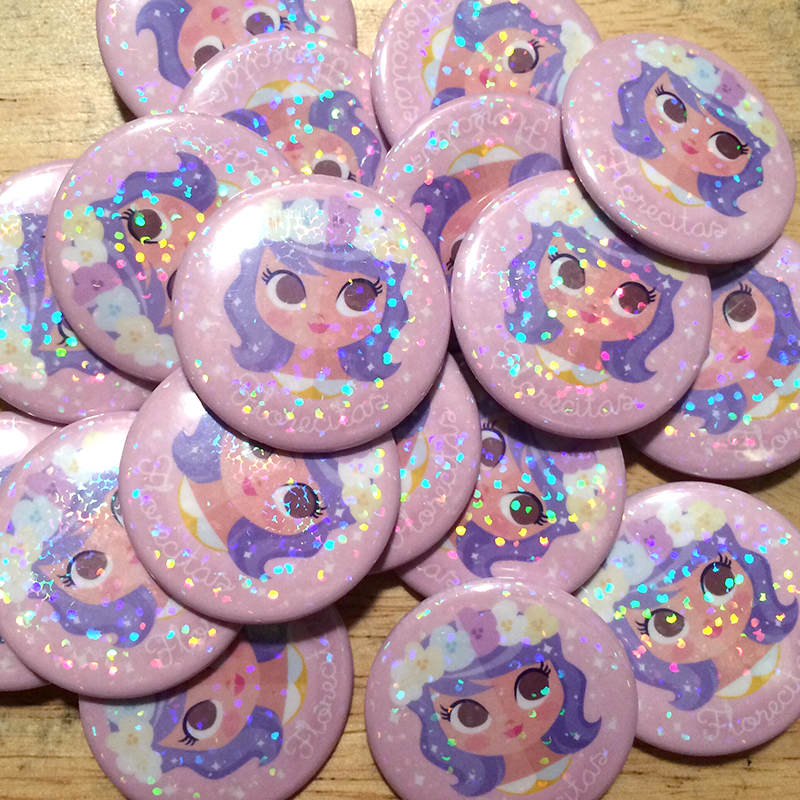 A larger order means you get a cheaper cost per individual button. You can also order as many different designs as you’d like for no extra charge. My typical turnaround time is between 3-5 business days. Orders over 1,000 may take longer depending on availability of supplies. I ship my buttons using USPS Priority Mail flate rate boxes. After I ship out your order it should arrive between 3-5 business days. 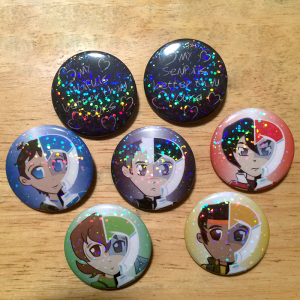 If you need your buttons faster, please let me know when you place your order. You order is considered a Rush Order when you need the buttons to arrive within four days of placing the order. 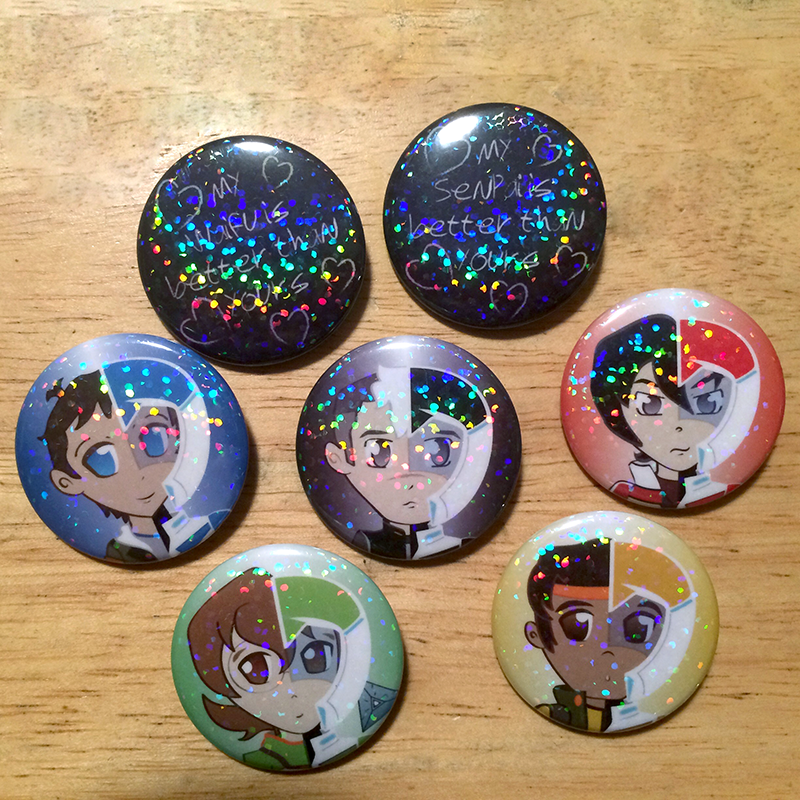 For example, if you order on a Monday, and need the buttons to arrive by Friday, it would be considered a Rush Order. Rush Orders cost an extra 25% of the total button cost, plus Overnight shipping, which varies depending on the size of your order. If you’ll be attending one of the same conventions as me, then you can pick up your buttons at the show and save on shipping costs. You can mix and match between products and sizes! If you want to order five 3.5” Mirrors, fifty 1.5” Magnets, and one hundred 1.5” pinback buttons, go right ahead! You only have to pay shipping for heaviest item. Important! Payment is due in full before I’ll start working on your order. To use my templates you’ll need to have access to Photoshop, or a similar program. To download the templates, and view the tutorial on how to set up your button designs click here. If you don’t have access to the right programs, or don’t want to deal with it, there’ll be a small fee of ¢50 per design for me to format your artwork. If you have any questions, or are ready to order, please fill out the form below, and I’ll get back to you as soon as possible. Once I’ve given you your quote and received your artwork I’ll send you an invoice with the amount due.